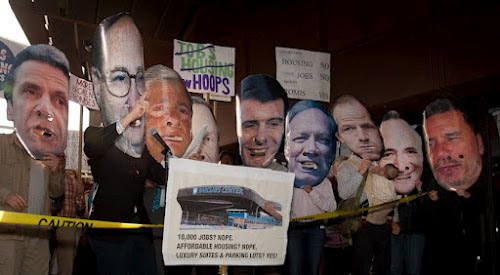 You can Google up the story the Times published, “Barclays Center's Opening Is Met With Protests” (see image above): Google will tell you the story is available on the web but because the Times removed its first draft of history from the Times web site you won't find it there. The Times expunged a narrative that was relatively favorable, by Times standards, to those opposing Ratner’s Atlantic Yards to replace it with an article representing the pro-Ratner narrative the Times has been favoring, one complimentary about the opening of the “Barclays” Center arena and snarkily dismissive of the opposition to the Ratner/Prokhorov megadevelopment. The M.C. was Candace Carponter, a spokeswoman for Develop Don’t Destroy Brooklyn, one of the groups representing residents of the surrounding neighborhoods. She called the arena “a monument to crony capitalism,” saying that “the vast majority of Brooklyn will not benefit” from the 22-acre, $4.9 billion project, which includes the arena and more than a dozen housing towers. She said that a commercial tower that was supposed to deliver the thousands of promised jobs had not been built and that only a few full-time jobs would result from the arena itself. “Ratner has not fulfilled any of his promises, not a single one,” she said. Kathleen Noriega told the assembled protesters that she once had been a supporter of Mr. Ratner’s project because he had promised hundreds of construction jobs through an apprenticeship program. But those in the program did not get training in construction, she said, but instead performed difficult demolition work for no pay. Ms. Noriega is involved in a lawsuit against Forest City Ratner. The protest news conference began on the outdoor plaza, but when the rain became stronger, the protesters moved under the shelter of a canopy at the entrance to the arena built by Mr. Ratner’s company. Ironically, (see image below) the half page of pretty color pictures* that accompany the pro-arena story appearing in the Times print edition ran opposite a large black and white photo of Richard J. Lipsky, a former Ratner lobbyist, coming out of a courthouse accompanying a story about his sentencing for political corruption. 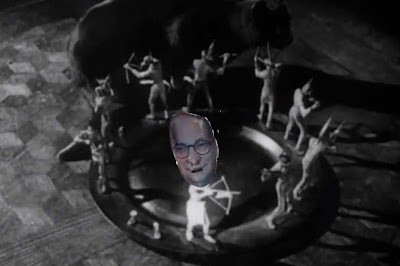 There is a very intriguing possibility that Lipsky, who has recently been spilling more beans to federal prosecutors in exchange for a lighter sentence, may be implicating Ratner and/or others in the Atlantic Yards circle of players, many of whom are morally sketchy enough to have already met comeuppances in a variety of ways. Should the Times have deleted a story? The Times often covers unfolding events with evolving web versions of their stories. Normally, the earlier stories get updated and added to with the original content remaining. Sometimes entirely new versions of stories are written but that doesn’t mean that the old versions get removed or replaced by different stories written with completely different by-lines. Google, attempting to take you to the story about protest that you googled (or provided to someone else as a link) now takes you to an entirely different story with a new by-line. Joe Berger's by-line was on the original story. The rewriting of history came courtesy of the by-line of N. R. Klienfield, who is noted to have been assisted in his writing by five other Times writers (Howard Beck, Joseph Berger, Sam Dolnick, Matt Flegenheimer and Michael M. Grynbaum.) for a total of six reporters contributing the content the editors could arrange to their liking. Take the monopoly away from Ratner! Take the mega-monopoly away from Ratner! You can’t negotiate with a monopolist! The “Barclays” LIBOR Center Pays no taxes! I repeated these lines in rotation more than once. I think I know Borough President Markowitz well enough to know that if he thought he could have provided a credible response he would have tried one. Instead, he fled fast into the arena, flustered and apparently shaken. My remark actually referred back to the Times' own cover story from two days prior, written by Charles V. Bagli and Joseph Berger (Mr. Berger, you'll note, was the reporter whose byline was on the expunged story). In that front cover Bagli/Berger Times story the paper informed the public how, at the mega-project's inception, New York government officials did us all the immense disservice of awarding what amounted to a 30+ acre monopoly to a developer who had a reputation (only "solidified" by Atlantic Yards) for not honoring promises. The favor the Times editors may have done me of including my remark about not being able to negotiate with someone having a monopoly might have been granted with the thought it would not be readily comprehended, without the benefit of context, by someone skimming fast through a rave about the arena. It really shouldn’t be so hard to understand. The Times, however, perhaps remembering its business relationship with Ratner, likes to play along with Ratner’s narrative and the idea that he should keep his mega-monopoly. PS: (Added 09/30/’12) Here is Norman Oder’s Atlantic Yards Report take on the Times revisionism, presented in the form of an open letter to the Times Public Editor, that points out how the Times’ deletion of the earlier story from the Times web site violates what the Times Public Editor says the stated the policy of the Times should be: Saturday, September 29, 2012, An open letter to the New York Times Public Editor: Why not retain both versions of Barclays Center opening coverage? (The changes were dramatic and dismissive). And Mr. Oder notes another paragraph from the article that the Times banished to the void of oblivion. While the concert went on, there was a free screening of a documentary, “Battle For Brooklyn,” near the arena. The movie chronicles the long fight waged over the project, focusing on Daniel Goldstein, who was displaced from his apartment and has been the leader of the opposition. The above image (click to enlarge) is a photograph taken at tonight’s Candle Light Vigil led by local politicians and clergy: A mega-bright Barclays “oculus” promotion for the opening of the Jay-Z 40-40 Club, the mega-wattage illuminating it paid for by the tax bills Jay-Z and the “Barclays” Center don’t pay . 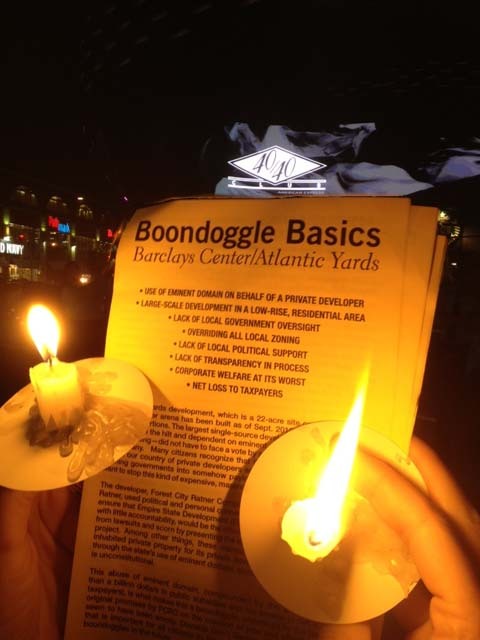 . . and candles walked counterclockwise twice around the arena in community protest illuminating the alternative message for the evening. The community events protesting the arena's opening continue tomorrow and Saturday. Following up on three Noticing New York articles on the subject (Thursday, September 20, 2012, Embroiled In Embarrassment of Hosting Controversial Advertisement MTA Considers Banning “Issue Advertising”: What About Barclays LIBOR Scandal?, Saturday, September 22, 2012, Clarification From MTA: Despite Furnishing Assets, Subsidy And Subway Station Renaming Transportation Agency Disavows Promotion of Barclays Bank, and Wednesday, September 26, 2012, Promoting Obfuscation of What Government Does and Doesn’t Do To Give The Private Sector (Including Ratner) More Credit) I appeared at today’s MTA board meeting and gave comment about revisions reportedly under consideration by the MTA to revise its policies about how freely its public assets are used to promote or promulgate questionable or embarrassing messages the MTA might not want to be seen as implicitly endorsing. I was the first of nine speakers this morning, eight of which spoke about the subject of advertising. The other, in a wheelchair, spoke about accessibility of the system to the wheelchair-bound. The subject of the use of the MTA system’s assets for undesirable advertising had been brought to the fore and covered in the press because Pamela Geller’s American Freedom Defense Initiative won a case against the MTA wherein the MTA was recently judicially ordered to run ads from her organization that include anti-Arab slurs and tell subway riders to “Support Israel” in the Middle East conflict. I have made the point in Noticing New York that the MTA’s very costly devotion of assets in the promotion of “Barclays” is comparably, and in several ways more, embarrassing. The MTA is more intricately involved in the Barclays promotion and, given the record, its complicity is easier to argue and seem to have been more premeditated. Aside from me, the third speaker also brought up the subject of Barclays, as well as the fourth speaker who, yelling, also mentioned it. Another speaker got into the effects on the MTA’s budget of the LIBOR rate-fixing manipulations with which the Barclays name is automatically associated. Throughout the remarks, and in signs brandished, the 99% mantra was championed. The woman in the wheelchair who spoke similarly had Occupy Wall Street messages stuck to the back of her chair. If I’d had time I might have referred to the fact that the misdeeds of Barclays are considered symbolic of abuses by the 1%. The last speaker was Pam Geller herself defending her ads which seem designed to garner publicity with provocation. She was drowned out twice with an OWS-style “mic-check” attack. • what government is or is not endorsing. • One easy answer is to cut back on advertising. Anyone who thinks that advertising is bringing in significant sums to support the MTA budget has lost track of their decimal points. Should the subway hubs be named after corporations, all odds with respect to their continued respectability be damned? • Your new policy will have to consider whether there will be grandfathering: Will your policy mean that MTA resources that have been devoted to ill-advised, unseemly promotions (Barclays Back being an example) be terminated? Or will such ill-advised arrangements nevertheless be honored, treated as automatically immune from revocation because of grandfathering, or as existing contracts that you deem cannot be voided? • Forewarned is forearmed. As you are able to envision such awkwardness in the future (given your experience with Barclays), what standards will you invoke so that MTA contracts can be revoked? In the future you would not want to have New York subway stations continue to be conspicuously named after a bank like Barclays that, for example, the MTA may need to sue for losses it has incurred through the LIBOR scandal. • You may think that the answer is to distinguish between running “issue advertisements” and advertisements that are simply promotions of corporate names and products. I suggest that this would be unfair. It would just result in an inherent bias toward support of corporatism. It would mean, for example, that despite Barclays misdeeds that bank could still advertise, presumably implying that its name remains respectable. The sole restriction? 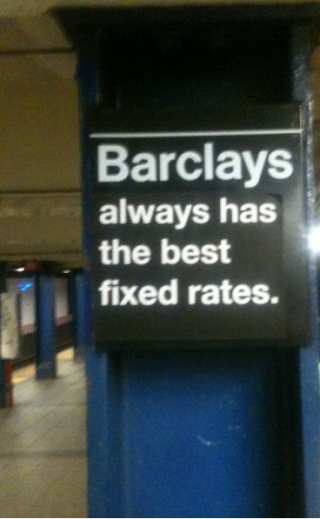 : Maybe you wouldn’t permit overt arguments in MTA ads that Barclays misdeeds constituted no wrong. But the implication of respectability would remain.- meanwhile, balancing ads that argue that the faults of Barclays should be observed would be banned as issue advertisements. Would this be fair? • Perhaps the answer is for the MTA to be theoretically neutral, accepting ads from any and all comers provided fair value is paid to run them. But by these standards the MTA should be in trouble for its Barclays promotions because the compensation it received when it agreed to rename subway hubs after “Barclays” was only a mere fraction of true value; at the time it was 1/100th of what the developer was believed to be getting for putting the bank’s name on the Ratner/Prokhorov arena. Below is a final point I could not speak fast enough to squeeze into the two minutes we were allotted to speak. As it was, I was tripping over my words to get out as much as I could. With only two minutes it is a challenge to think whether to sacrifice: 1.) Comprehensiveness, 2.) coherence and cogent points, or 3.) speech that is slow enough for good effect and emphasis. • These concerns are part of a much bigger problem: What kind of world is it when the government acts as if its own interests (and those of the public) are inherently subservient to burnishing the image of big private sector corporations over less flattering realities?- In that regard I refer you to the MTA’s collaboration in a Daily News promotional article for the “Barclays” Center selling to the public the absurd notion that Forest City Ratner provided construction of a new subway entrance to the public gratis and at no taxpayer expense. When I left the meeting the MTA board had gone into executive session without yet discussing the advertising policy and from the agenda available at the meeting it is not clear that they intended to get to it today. I will have to rely on other reporting and update this post if I hear that they said anything with respect to it after the executive session. Much of the interesting discussion before the board went into executive session concerned upcoming changes in board meetings. There will be fewer board meetings: It was discussed whether that would be closer to 20% or 30% fewer with ex-governor David Paterson doing the math in his head that it will be closer to the latter. It was argued that, for transparency sake, more information would be going out to the public sooner in more readily accessible form. Most interesting though is that the MTA board process will start including special sessions where the public will be able to ask questions that will be answered there and then by MTA staffers or board members. Here is a starter question: The MTA went to court to test its legal right not to run the anti-Arab advertisements from Pamela Geller’s organization- Why hasn’t the MTA thought about similarly testing is legal right not to keep the “Barclays” name on its subway hubs? Here is a brief WNYC report on the hearing that is also taking comments: Protest Breaks Out at NY MTA Meeting Over Ad Policy, by Transportation Nation, 09/27/2012. This is a necessary follow-up to two earlier Noticing New York articles about the trouble the MTA has gotten into with corporate advertising and branding, something the MTA is scheduled to evaluate and take public comment about tomorrow morning at 9:30 AM (details below). The main problem when government gets enmeshed in advertising, lending out public assets as vehicles for corporate advertising and corporate promotion, is that it obfuscates what government does and doesn’t do. Notwithstanding how promotional advertising images are seemingly plastered everywhere in the transit system these days, anyone who thinks that corporate advertising and promotions pay for any substantial portion of government services isn’t keeping track of their decimal points. The public pays for virtually all of what government provides; in the MTA’s case that's more than 99%. And then there are the questions about whether government is endorsing any of these ubiquitous messages that appear rampantly on the public's property. . .
. . . Does the MTA endorse promotion of the Barclays Bank, virtually synonymous with the LIBOR scandal in connection with which the MTA, amongst other New York government entities, may be suing Barclays for losses? The MTA has deeply subsidized the Ratner/Prokhorov “Barclays” Center basketball arena that promotes that bank’s name and the MTA has named two subway hub stations in Brooklyn after the bank. No! The MTA says that it similarly disavows such promotion of the bank. . . . The Tracy Collins photograph (below) captures Mr. Lhota’s arrival at the ribbon-cutting festivities. As I have made the point before, (also here), government’s surrender to advertising evidences a lack of self-respect, particularly when it means that appropriate credit is not given to government for what it does. When government surrenders to messages and promotions that clearly need to be disavowed, such as promotion of Barclays Bank, then the abject lack of self-respect stands out in even starker relief. But the willingness of government to prostrate itself in making the corporate sector look good at government’s expense may be even more pervasively ingrained. It appears to extend beyond just awkward images that result when handing over public assets for an advertising fee. The Daily News article, which was an exclusive, appeared before the newspaper announced (on the day of the ribbon-cutting) that it had entered into a sponsoring partnership with the developer/subsidy collector so that the plaza outside the “Barclays” arena will be called the “Daily News Plaza.” Examining how so-called “news” organizations prostrate themselves and become unquestioningly complicit in the promotion of real estate developer schemes is a subject for other articles. This article is about the disrespect government shows itself with such prostration. 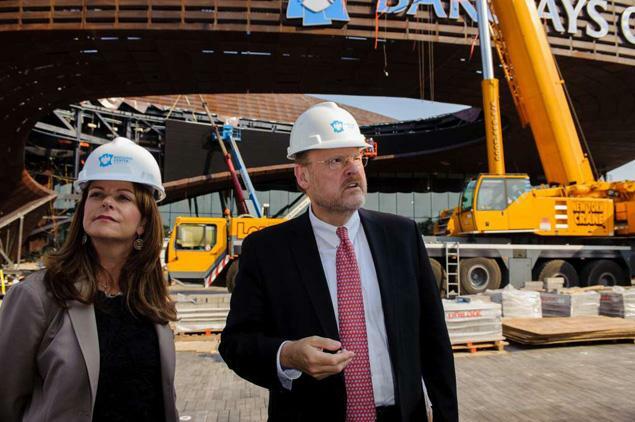 The September 13th Daily News article featuring Mr. Lhota was essentially about that just-mentioned plaza outside the arena in that it focused on the completion of the subway entrance in the center of the plaza. It cost $76 million. No, it’s not paved in gold. But not a cent of it came from taxpayers’ pockets. “It cost $76 million” and “not a cent of it came from taxpayers’ pockets”? That sounds absolutely too good to be true, and it is. As we are all supposed to know by now, when you hear something that is `too good to be true’ you are almost certainly on the other end of a con. The government has paid plenty to Forest City Ratner, far more than the value of the supposedly “free” $76 million subway entrance. The developer has collected all sorts of subsidies: Hundreds of millions in direct cash, write-downs on the value of land it’s getting from the MTA, donation of free streets, avenues and sidewalks, being excused from real estate taxes, . . . the list goes on and it amounts to a substantial net loss for the public. All told, Forest City Ratner is looking to walk away with subsidies totaling $2 - $3 billion. 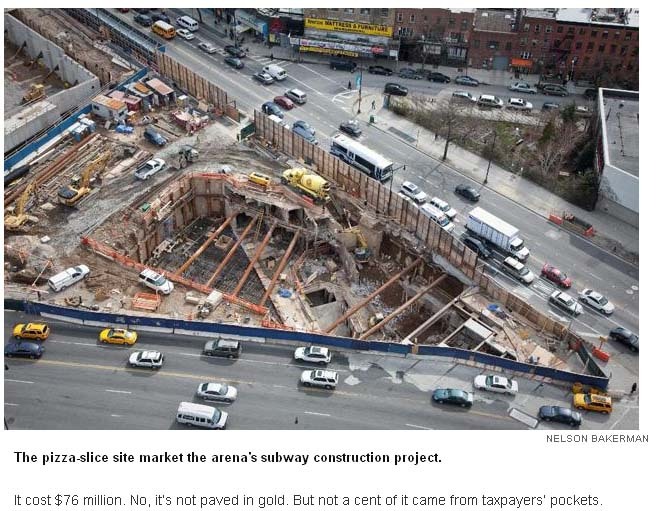 And construction of a subway entrance in all of this is somehow counted by the Daily News as a free gift from the developer? But shifting credit due to government to the private sector is the very theme of the article in which Mr. Lhota was collaborating to produce. 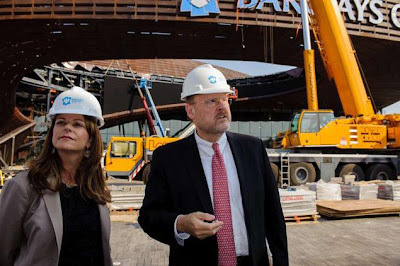 Below, see the article’s picture of Mr. Lhota at the site. Mr. Lhota’s words in the article extol the benefit of private-public partnerships, with Mr. Lhota using the opportunity to promotionally “give Ratner credit” for what government paid for. From the MTA’s perspective, the station marks the kind of public and private dealmaking that attempts to place the city and its people first. So that means Mr. Lhota is backing Ratner’s government-assisted mega-monpoly over Brooklyn’s key subway lines, more than 50 acres of monopoly, with 30+ contiguous acres extending out from the arena site! And one way he is promotionally backing it even more is through the article's denial of the resources the government committed in bringing this about. . . knows the only way to change public opinion is with repeated successes.
. . . repeated successes that are paid for by the government without acknowledgment. In contradistinction to Mr. Lhota, renowned urbanest and thinker Jane Jacobs viewed private-public partnerships as suspect arrangements. Her 1992 book, “Systems of Survival: A Dialogue on the Moral Foundations of Commerce and Politics,” has probably not gotten the attention it deserves. In it she argues that mixing of government and business tends to result in a degradation of fundamental moral systems and principles. With such intermixtures, government officials reorienting themselves to serve business interests are prone to forget that they are supposed to perform an essential guardian role protecting the public interest first, foremost, and above all else.
. . . subsidies falsify both costs and prices. . .And as I indicated earlier, lies of that sort warp development. . . . . An oddity of the Soviet System was that the costs of most production and services were unknown. Really unknown. Managers of factories, offices, farms, mines, hospitals, Theaters, whatever— they literally did not know the costs of what they were producing. Budgets existed, to be sure— allocations of expenses— but these were so infused and confused by subsidies that they bore little or no relation to actual costs. Cost accounting didn’t matter in any case, because prices were fixed by edict. So, although Mr. Lhota may be waving the banner of free enterprise when he extols private-public partnerships, as Jane Jacobs would see it he is really promoting a system that has more in common with the Communism of the old Soviet Union. . . as cavalier about costs and prices for quite different reasons . . . Russian enterprises still ignore cost accounting. Their people don’t know how to do it, and they don’t seem to learn, because they evidently don’t understand its importance as guidance to what they are doing well and what they’re doing badly. Monopolies, established by cronyism and strong-arm methods, along with pervasive extortion and corruption, falsify actual cost anyhow; racketeering enterprises prefer eliminating competitors to competing with them on prices, quality and services. No wonder Bruce Ratner and Russian Oligarch Mikhail Prokhorov feel comfortable with each other as partners. What About Falsification of Benefits? Like Jobs? Ratner development in New York City is promoted because it ostensibly will create jobs. Lhota (before he says people need to realize the benefit of the Atlantic Yards megadevelopment) says, “The job growth in downtown Brooklyn leads the entire city,” but the job figures for the Atlantic Yards mega-project itself are simply falsified and unreal. See: Thursday, July 12, 2012, Do Forest City Ratner's part-time arena job numbers add up? If a maximum of 800 people work an event, it seems doubtful. First of all, when I cover these kinds of developments I try to avoid using the numbers because they can be very misleading or very concocted. . . Notwithstanding that the numbers are so misleading and concocted that the New York Times reporter, who is probably best qualified to know, doesn’t think they should even be reported, there are all sorts of extraordinary numerically stated exaggerations “thrown about” by all sorts of people, including politicians like Senator Charles Schumer, as the reason mega-projects like these should proceed. Based on the theory of these benefits that couldn’t be quantified in real numbers Ratner was allowed to wipe out his competitors with eminent domain.
. . . the richest— which means the most expanded— economies are diverse economies. The practical link between economic development and economic expansion is economic diversity. “Let things grow. Don’t let currently powerful government or commercial enterprises strangle new departures, or alternatively gobble them as soon as they show indications of being economic successes. Stop trying to cram too many eggs into too few baskets under the keeping of too few supermen (who don’t actually exist except in our mythos).” If people of the distant future care sufficiently and have sufficiently good documentation, they might note that an American president named Theodore Roosevelt, who portrait likeness they could still see, carved into Mount Rushmore, had staved off destructive corporate cannibalism for about a crucial half century before it was loosed in the 1960s and intensified in the 1980s. In getting into a description of why monopolies are bad in general (and they are), I have let this article stray a trifle from what is intended to be its main point: That government acts with a demeaning lack of self-respect when it is willing to prostrate itself to make its corporate sector private partners look good at government expense. The false accountings one sees in Mr. Lhota’s Daily News article also intentionally confuse the issues of how much is lost and how little gained with these mega-projects. I started by describing the problem the MTA is scheduled to evaluate and take public comment about at tomorrow morning's meeting: The difficulties presented when government gets enmeshed in lending out public assets as vehicles for corporate advertising and corporate promotion, and how that creates confusion about what government really does and doesn’t do, and the difficulty in making clear what government is or is not endorsing. But these concerns are part of a bigger problem: What kind of world are we confronting when the government consistently acts as if its own interests and those of the public are inherently subservient to promoting the image of big private sector corporations over less flattering realities? The MTA may have stated that despite the very substantial resources it has committed behind the “Barclays” campaign it doesn’t, in fact, endorse the Atlantic Yards promotions of Barclays Bank. But what about the bigger picture: The MTA’s participation in a Daily News article that promotes Forest City Ratner with the howler that the construction company is handing out subway station construction projects at zero cost to the taxpayers? That's an interpretation that is only possible when government collaborates in a public relations charade about the real numbers. Keeping track of the real bottom line, the real cost of things, is essential. Mr. Lhota was once the Budget Director for the City of New York. Presumably he knows exactly how to keep track of the bottom line . . . and he ought to do that. Spoiler Alert! 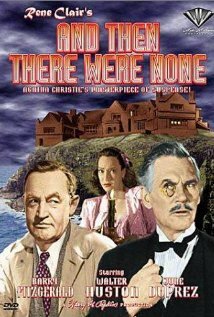 : A key feature of the plot is that all of the doomed visitors had it coming, they all had previously been complicit in the deaths of others but escaped notice or punishment. So it is with the cast of Atlantic Yards perpetrators. In real life they seem close to replicating what, although it was fun, seemed like a preposterously contrived plot! Well, attending the alternative ribbon-cutting orchestrated by community opponents of the Ratner/Prokhorov “Barclays” arena last week reminded me that I still needed to come back and fulfill presentation of the enumeration I earlier promised. • Former Atlantic Yards executive Jim Stuckey, who last we heard is being sued for sexual harassment. • Atlantic Yards cheerleader Sen. Carl Kruger, convicted and sentenced to nine years for corruption. • Ratner’s Atlantic Yards Lobbyist Richard Lipsky, convicted of bribery. • Atlantic Yards cheerleader and head of the Carpenters Union Local Sal Zarzana, indicted for extortion. • Too many MTA & ESDC executives to count. • The world’s most talked about starchitect, Frank Gehry. • Former Forest City Ratner Executive and Political Fixer Bruce Bender, who left the firm and can’t be here today to F*[ck] The Bridge. • And of course Barclays former Chief Officer Bob Diamond, forced to resign because of Barclays LIBOR interest rate-fixing scandal. Although there is no doubt he got his wish to USE Brooklyn to spread the bank’s global brand. Welcome Members of the Press. It is an honor to have you with us. We are lucky today to have for you local theater troop, The Land Grab Players. And what is even luckier for you, is that their ribbon cutting will only take about ten minutes, before you gotta go inside that building and spend 3 hours in hot air. This array of cronies present: the LIBOR FIXER CENTER RIBBON CUTTING Take it away Land Grabbers! Goldstein’s list could obviously have been longer: In his willingness to keep things short Mr. Goldstein left out two other prominent non-attending politicians who were driven out of office after sullying themselves, perhaps because those politcians did stand right behind him at that moment in bobble-head effigy form: former governors Eliot Spitzer and David Paterson (see photo below and video above). If Sheldon Silver left his office in ignominy it would knock out the last elected politician of a very short list of politicians who gave Atlantic Yards the only official approval it received from any elected officials: The approval came from only four elected individuals and the other three have already left in disgrace. This sole approval to which I refer was the approval of Atlantic Yards by the Public Authorities Control Board (PACB). The approval was required by a vote of three individuals, the aforementioned Governor Eliot Spitzer and Assembly Speaker Sheldon Silver together with senate leader Joe Bruno. The approval then had to be accepted by State Comptroller Alan Hevesi. We all know about the hypocritical scandal involving use of prostitutes (a crime Attorney General Spitzer once prosecuted) that forced Spitzer out of office. Spitzer did not comport himself admirably with respect to Atlantic Yards. Joe Bruno was convicted of corruption although he will need to be retried because the federal “honest-services” law he was found to have violated (which law makes it a crime “to deprive another of the intangible right of honest services”) was ruled to be insufficiently specific. Alan Hevesi was forced out in scandal two days after he reviewed and accepted the PACB’s approval of Atlantic Yards. What is it that draws such individuals, like moths, to the flame of eminent domain abuse? One thing to remember is that eminent domain abuse is basically a subset of a bigger category of abuse: Crony capitalism. So we are really looking at the question of what draws these moths to the flame of crony capitalism. That being understood it is probably not so surprising that their wings ultimately wind up aflame for one kind of selfish conduct or another. How absurd it is that politicians thought it was justifiable to abuse eminent domain to give Forest City Ratner a mega-monopoly over 30+ acres of Brooklyn sitting astride its most important subway lines? The purpose of the mega-monopoly was to wipe out competition for Ratner and also, perhaps more important, to ensure that government officials would never have any negotiating power with the developer/subsidy collector to enforce promises, to demand quality of product or to keep costs in check. In other words no ability to procure for the public any of the things that negotiating leverage can produce. Atlantic Yards could not have happened had the Kelo v. New London, Connecticut case not paved the way for such abuse. Kelo is the case that went all the way up to the Supreme Court that made eminent domain abuse legal. Bad as the Kelo case was, the New York State courts have gone even further in legalizing such abuse in Kelo's wake. The abuse of eminent domain didn’t work out in New London (it was focused on benefitting pharmaceutical firm Pfizer). And it didn’t work out for for those perpetrating the New London scheme either. I wrote about it here: Monday, December 21, 2009, Eminent Domain Abuse: The Gifts That Keep On Giving and the Gifts That Don’t. 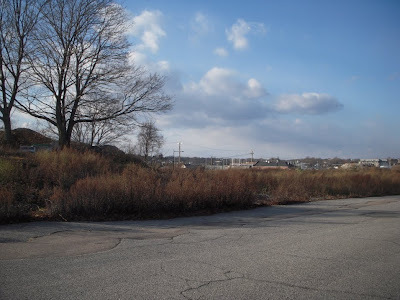 Where once there were homes and a neighborhood there is now an expanse of empty lots. Pfizer, the firm being catered to when the scheme was concocted, left town without any envisioned benefits materializing. It should be noted that eminent domain abuse is considered to be technically legal. Were that not the case the takings of property it permits would simply be considered abject examples of theft. Daniel Goldstein’s list of ne'er-do-wells to whom good riddance has now been said probably evolved from this earlier Develop Don’t’ Destroy Brooklyn-supplied starter list of seven indicted, disgraced, sued, or criminally guilty perps (politicians, political fixers, and political gamesmen) that includes supporting links to the relevant background stories of anti-social behaviors coming home to roust: A Ratner's Gallery of Cronies, Friends, Partners, Fixers and Shrill Supporters. When I wrote the above referred to December 2009 Noticing New York article about the Kelo eminent domain case I included a longer list of those who have left the Atlantic Yards scene without giving a good account of themselves, (that started with a list DDDB had put out six months before). Since 2009 the list has grown. The list I have set forth below reprises names already mentioned in this article. It also fills in the names of some of the government public authority officials that Mr. Goldstein referred to at the alternative ribbon-cutting as being too numerous to count. It isn’t expanded to include the names of the Westchester politicians who were federally prosecuted for their interactions with Forest City Ratner in connection with the Ratner Ridge Hill project. To be fair and clear, the list below is only the extensive list of those whom the eminent domain-abusing Atlantic Yards mega-project did not embrace very long or lovingly. It is not necessarily or exclusively comprised of individuals who got their comeuppance or departed in disgrace for unseemly behavior although it does include such individuals of that character focused on at the beginning of this article. . . Still, it includes such people as Starchitect Frank Gehry: He was not forced from the scene for misdeeds but his reputation suffered in connection with his shilling association with Atlantic Yards and the cavalierly ignorant arrogance he displayed proclaiming that he viewed himself as “building a neighborhood practically from scratch.” It also includes such people as ESDC head Marisa Lago, who seemed to think it was just fine and dandy that she believed that Atlantic Yards could easily take forty years to build even though her agency's environmental assessment documents represented that it would take no more than ten years to build. Virtually by definition no one on this list came away from their dealings with the Atlantic Yards mega-project with clean hands. • PACB Approval member Joe Bruno. 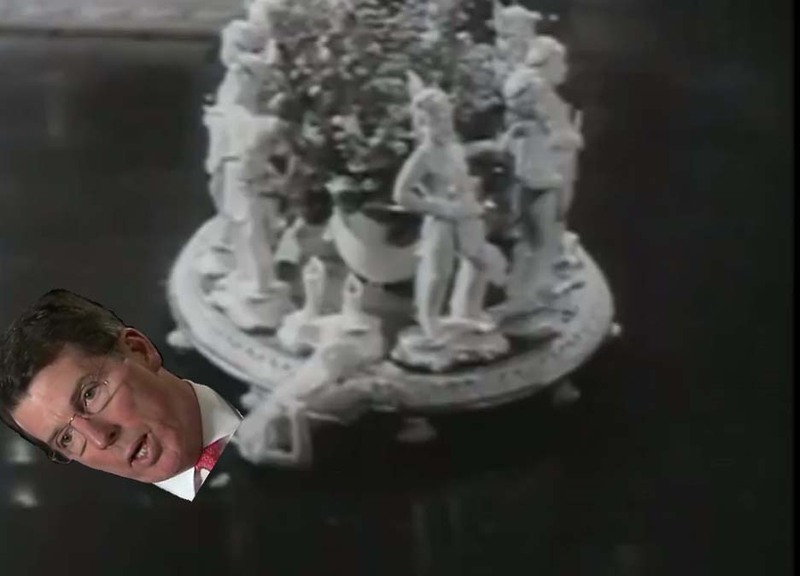 • And, of course, the sparkling Mr. Robert J. Diamond, the former the chief executive of Barclays Bank, the LIBORously scandalous bank after which, thanks to our politicians, subway hubs and a city block with an arena have been named. I do not think that the answer in explaining why so many on this list have crashed and burned is simply to believe that all politicians and developers are corrupt. I think the answer is that the ones attracted to eminent domain abuse and crony capitalism are. 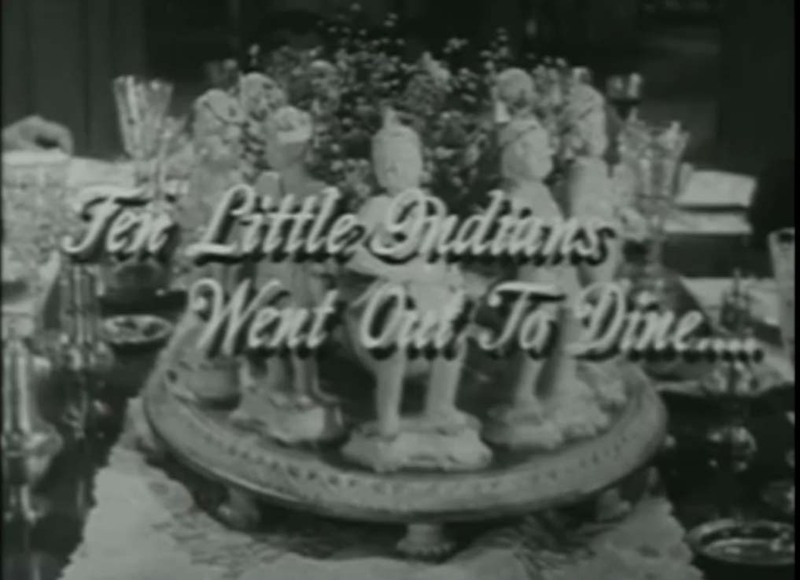 In the “Ten Little Indians” story the unseen hand of the murderer (a judge) was dealing out his version of justice to guilty individuals he deemed to have escaped their just desserts, those he proclaims “to be guilty of certain crimes which the law cannot touch.” In real life, the eminent domain abuse theft at the core of Atlantic Yards went unpunished, treated as if it were legal. While there is no sentence-dispensing judge contriving it as in the Agatha Christie plot, it does seem as if comeuppances have a way of coming up for those individuals complicit in that land grab which, but for treating eminent domain abuse as legal (notwithstanding all its faux pretext), is the grandest of recent civic crimes. 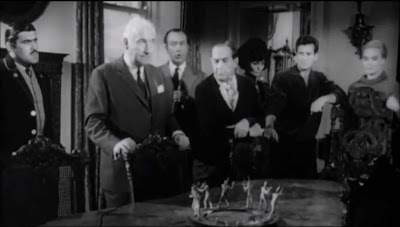 Without the plot device of an unseen judge contriving the result these individuals seem to get lured to their justice-delivered fates by their own character: What drew them to eminent domain abuse and crony capitalism draws them also to the other selfish improprieties and illegal maneuvers for which they were ultimately punished. This suggests a simple shortcut: What if theft by eminent domain abuse were made illegal again? The way it should be. Then we would not have to sit around, as if in a suspense novel, waiting for the unseen hand of fate to deliver fitting justice! Thursday’s MTA board meeting consideration of this matter is a response to the MTA’s being judicially ordered to run advertisements in the subways that polemically equate Arab nations with savages while instructing New York subway riders to support Israel. The MTA didn’t want to run the ads and its refusal was what landed it in court. I wrote about how, in another equivalent situation, the MTA also probably ought not to want its assets to promote the LIBOR scandalous Barclays Bank, which the MTA itself (together with other New York government agencies) may wind up suing over losses it has suffered by reason of the bank’s interest rate-fixing. The MTA assets committed to promote the “Barclays” Center (the Ratner/Prokhorov basketball arena) and thus Barclays Bank are far more substantial than the MTA assets committed to the ads telling people to support Israel in the Middle East conflict. The controversial Middle East conflict ads will run in ten MTA subway stations for one month. The Barclays promotion involves renaming, for twenty years, two subway hub stations in Brooklyn after Barclays Bank (for instance, putting the name of the bank on zillions of subway pillars, on maps and in subway announcements). It also involves very deep subsidy from the transportation agency to the Ratner/Prokhorov basketball arena that is to promote the “Barclays” name over that two-decade period. The arena constitutes a financial net loss to the public calculated in multiple hundreds of millions of dollars. In my prior article I noted that the MTA had issued a statement that included in a disavowal of the Middle East ads and noted that the MTA had not yet issued a comparable disavowal of the Barclays promotion. Well, I contacted the MTA’s press office about this and the MTA has now issued such a disavowal of the Barclays Bank promotion. I contacted MTA Media Liaison Aaron Donovan and pointed out that I was aware that the MTA had issued a statement that included a disavowal of the American Freedom Defense Initiative advertisements promoting support for Israel in the Middle East conflict. MTA does not decide whether to allow a proposed advertisement based upon its viewpoint and the MTA does not endorse the viewpoint in this or any other paid advertisement. MTA is currently reviewing its policy of accepting [such] . . . advertisements. I asked whether the MTA was willing to issue a statement that it does not “endorse the viewpoint” in the Barclays Bank promotion similar to the statement it issued in connection with the support Israel ads. I pointed out that, in the absence of the MTA’s issuance of such a statement it might be inferred that the MTA endorses promotion of Barclays Bank, the name of which has gotten a great deal of attention with respect to the bank’s admitted interest rate-fixing in the LIBOR scandal. The MTA does not endorse the viewpoints expressed in any of the advertisements posted in the system. That applies to issue-oriented advertisements such as the one you mentioned, and it applies to advertisements that propose commercial transactions. So the promotion of the LIBOR scandalous bank is not endorsed by the MTA, even though the huge amount of promotion the bank is getting is greatly facilitated by the substantial assets the MTA furnished, some would say carelessly, for this purpose. What I didn’t realize was that at almost the very moment that I was exchanging my communications with Mr. Donovan concerning the MTA’s disavowal of the promotion, MTA Chairman Joe Lhota was arriving that the “Barclays” Center ribbon-cutting event where Bruce Ratner and Mikhail Prokhorov were piratically (Arrgh!) 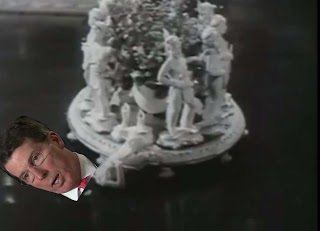 gloating over the glitz of all their stolen treasure. As DDDB noted (except maybe for incarnation as performing bobble-heads) local political official turnout in support of the arena was pretty pathetic. Mr. Lhota was apparently serving as a fill-in for the scarce higher level officials like Andrew Cuomo, who need to be concerned about reelection by the voters. I attended the earlier alternative protesting bobble-head ribbon-cutting ceremony but in very short order a quick subway ride had landed me back at NNY headquarters where I was discussing the MTA’s disavowal of the Barclays Bank promotion with Mr. Donovan. His e-mail confirmatory of that discussed disavowal arrived at 9:47 AM. 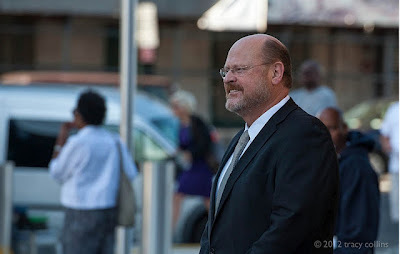 The Tracy Collins photograph that captures Mr. Lhota’s arrival at the ribbon-cutting (below) was taken at 9:01 AM. So, let's be clear: Non-endorsement of the Barclays promotion doesn’t mean not furnishing the assets utilized for it and it apparently also doesn’t mean disassociating from the accompanying promotional festivities. Is that clear enough for everybody? Isn’t that so cute!#? [:( . . .
. . . The cover of a “special 24-page section” the Rupert Murdoch-owned Brooklyn Paper issued today to fawn appreciatively over the Ratner/Prokhorov “Barclays” basketball arena feints at mention of, and almost seems to refer to, the LIBOR interest rate-fixing scandal for which the Barclays Bank name is a virtual synonym.- And then it actually doesn’t- Just the reverse in fact. The plastered headline “Banking on Barclays” punningly/cunningly (?) evokes the presumed reliability of the banking practices behind the “Barclays” name. It does that notwithstanding that most people who actually read real news should think of LIBOR instead. But, in truth, the Brooklyn Paper is probably not thinking in this vein: The Brooklyn Paper has never devoted one jot of ink, or even a few electrons of its web edition articles, to spelling out the acronym LIBOR and that includes the nine new feature articles inside the “special section” all of which mention “Barclays” repeatedly. . .
That pretty much leaves it so that the headline of the Brooklyn Paper cover (it was wrapped around the entire “news” of this paper this week) was pretty much intended to elicit, with absolutely no tongue in cheek, exactly the impression Barclays bank would like to instill into public folklore: That it’s a bank with reliable, sound and solid banking practices. Pshaw! Of course the Brooklyn Paper has less of a dilemma in this regard than the New York Times, which actually does report about the LIBOR scandal as a major story while at the same time running similar PR stenography for the developer/subsidy collector. The Times then has to figure out just how often and when to mention that, given the scandal, public promotion of “Barclays” is an incongruous embarrassment. So far: Three such mentions in the Times to the Murdoch Brooklyn Paper's zero.